There is no bad whisky. There are only some whiskies that aren't as good as others. Raymond Chandler is famously quoted as saying. But, whatever your whisky, this 400ml Glencoe lead crystal panel whisky tumbler is the perfect glass to enjoy it in. 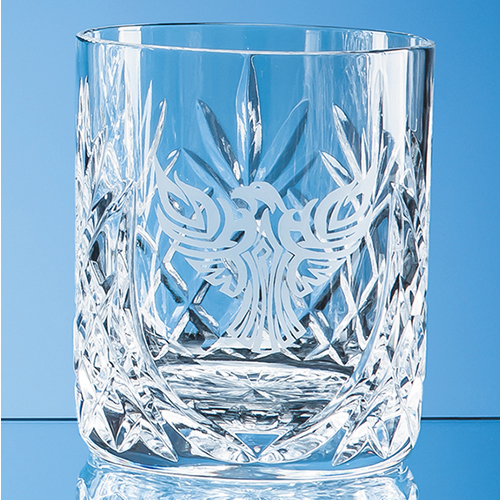 With an elegant cut pattern that will reflect the amber liquid and space to engrave a personal message, company logo or a crest, it is the perfect gift or award for a corporate achievement, sporting event or to mark a special occasion such as a retirement, anniversary, wedding or birthday. Available as an option is a beautiful presentation box with blue satin lining.